Abigail knew what icons were. When the Alversons started coming to the Orthodox church, Fr. Andrew told them all about icons. “The icons should have their own Sunday,” Abigail said with affection. She liked looking at the pictures of saints and thought they liked looking at her. There was something about them that made her happy. My heroine in Queen Abigail the Wise was bound to have good feelings about Orthodox icons. She is a bit of an artist at heart and has that kind of eye. So on the Sunday of Orthodoxy, Abigail doesn’t need to be convinced that the icons deserve special attention — she feels a particular fondness for them herself. Children rarely seem to need to be taught how to venerate icons. This photo is from St Anne Orthodox Church in Oak Ridge, Tennessee. The child-sized analogion was built by the rector, Fr. Stephen Freeman. Image by Magda Andronache. There’s a simplicity to that love of Christ that is possible for us every time we stand before icons. For some reason, I think it’s much easier for children to feel and know than it is for adults. There has certainly been enough debate about the use of icons in Christian worship — there was even a long and bitter battle, which the Sunday of Orthodoxy alludes to. But they are really the most natural thing in the world — a loving image of our Beloved and, by extension, to the events of His life, the parables He told and the many others who we love because we first loved Him. All the other things we say about icons are just words; the icons really speak for themselves … and children seem to have the easiest time “hearing” them. But just as the icons serve as a beginning of her troubles, an icon will help point the way to something better for her — a more mature faith that will be challenged and fortified. Abigail may have upset the little procession around St. Michael the Archangel, but what she doesn’t know yet is that she will have to go on her own little pilgrimage before she will be ready to arrive at the light of Pascha … and an icon will help her on that journey. 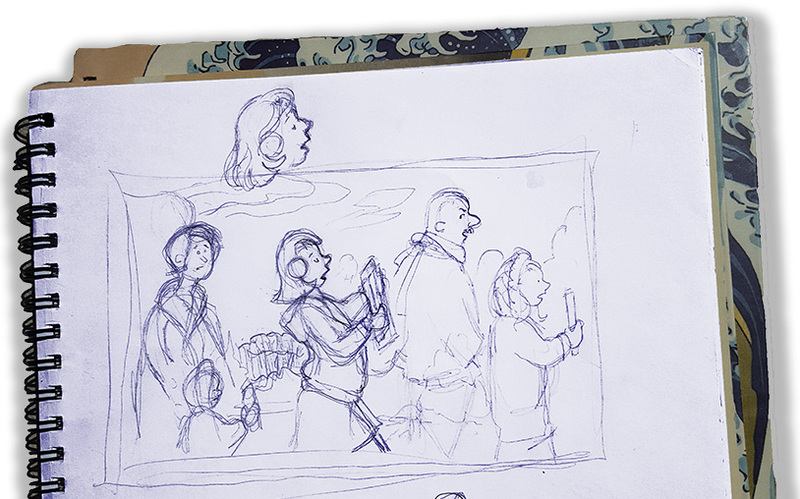 I liked this sketch of Abigail disturbing the procession, but I couldn’t find a good place to include it and it never made it into the book.